Dave Hughes, affectionately known as “Hughesy”, is a comedian who always seems to be described as “laconic”. “Laid-back” and “dry” are two other popular words used to describe his style of comedy. American audiences are, according to him anyway, fascinated by his broad accent, and US comedian Seth Rogen has said that he would turn gay for Hughesy (I presume he meant this in a light-hearted jocular sort of way, rather than a tortured confession of uncontrollable lust). The odd thing is, Dave Hughes isn’t particularly laconic or laid-back – he has plenty to say for himself, and he admits to being an insecure teeth-grinder. According to his profile on Twitter, he has an addictive personality and will be checking for replies to his posts in an OCD-like way. In his act, he pretends to be lazy and careless, but is relentlessly ambitious. He portrays himself as an academic failure whose education consisted of being hit around the head by the Christian Brothers, but he was Dux of his school the year he graduated. A man of contradictions, he is a teetotaller and doesn’t eat meat (except fish) for his health, but he hates vegetables, loves sugar, and (according to his Twitter posts) seems to be ill quite a lot. He meditates and reads self-help books, but still appears anxious and irritable. He appears on the customary left-wing comedy shows, but strikes me as a social conservative. Despite his working class rural background, ocker accent, and endless wardrobe of man-of-the-people shirts, he’s a multi-millionaire living a celebrity lifestyle. A stand-up veteran, he has appeared on radio and television for many years. Currently he co-hosts the breakfast radio programme, Hughesy and Kate, with Kate Langbroek, on Nova 100. He is also co-host of Channel 10’s light entertainment current affairs TV show, The 7PM Project, with Charlie Pickering and Carrie Bickmore. He married Holly Ife, a reporter with the Herald Sun, on New Year’s Eve 2006 at Flemington race track. Hughesy tends to portray his wife as both bossy and long-suffering. Dave and Holly have two children. 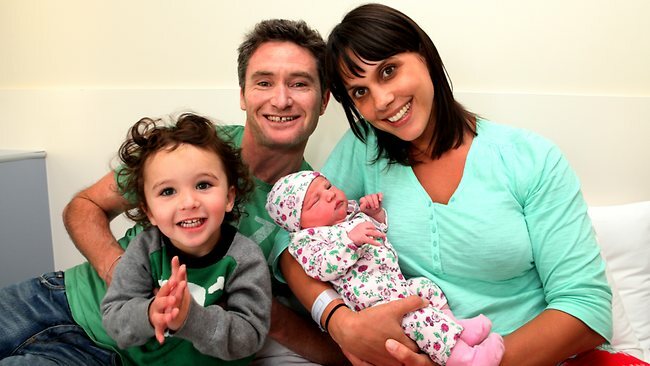 Their son Rafferty David was born in April 2009, and their daughter Sadie May was born in April this year. (Dave got the giggles while she was being born). Rafferty is “on trend” here, as names beginning with Raf-, such as Rafael and Rafi, are very much in vogue. It has a particular flavour in Australia, due to the old-fashioned slang, “Rafferty’s rules”, to describe a state of lawlessness. This was also the name of a police drama in the 1980s, starring popular actor, John Wood. More Australian-ness: Chips Rafferty was an iconic Australian movie star from the 1940s and 50s; and Rafferty’s Garden is a company which makes baby food. Sadie is starting to become fashionable here, following recent North American trends. For many years it was in the no-go zone, thanks to Johnny Farnham’s hit single, Sadie the Cleaning Lady, but does now seem to considered more usable. The Canadian kid’s TV show, Naturally Sadie, has probably helped. Christina Applegate’s daughter, Sadie Grace, was born just three months before Sadie Hughes. Keen-eyed starwatchers may have noticed a coincidence in the Hughes’ family names – English film star Jude Law has a son named Rafferty, and for several years was married to actress and designer Sadie Frost. I presume this was unintentional, rather than some sort of homage to Mr. Law. Rafferty and Sadie are a sibset with strong Australian associations; the names are shabby-chic, and have already been road-tested by overseas celebrities. I can definitely see the names Rafferty and Sadie gaining in popularity in the next few years. I really love Sadie and while Rafferty’s not totally my style, I do like the names together – and the Jude Law connection didn’t even occur to me until you mentioned it, so I don’t think it’s intentional either! I’m sure it’s not intentional too! Although if they have a son named Jude and a daughter named Sienna next, it will start looking a teensy bit suspicious … hehe. This is true 😉 I guess we’ll have to wait and see! I think Sadie should have a 3 syllable middle to balance it out, but that’s just pickiness.